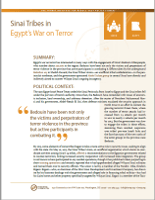 Egypt’s war on terror has intersected in many ways with the engagement of Sinai’s Bedouin tribespeople, who number about 250,000 in the region: Bedouin have been not only the victims and perpetrators of terror violence in the province but active participants in combating it. Efforts taken by the underground Battalion 103 in Sheikh Zuweid, the Sinai Tribes Union—an unofficial tribal confederation—in the peninsula’s northeast, and the government-sponsored Abdel Salam group in central Sinai have directly and indirectly aimed to counter Wilayat Sinai’s ongoing insurgency. 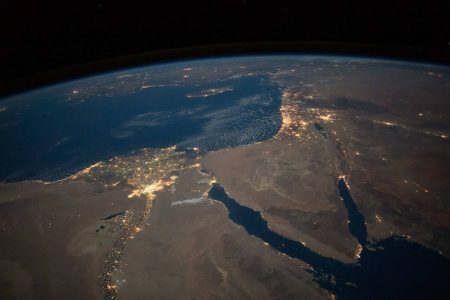 The 1979 Egypt-Israel Peace Treaty ceded the Sinai Peninsula from Israel to Egypt and the Sinai tribes fell under the purview of Cairo’s authority. Since then, the Bedouin have contended with issues of economic inclusion, land ownership, and arbitrary detention. After the ouster of President Muhammad Morsi and his government, then defense minister Abdel-Fattah El Sisi escalated the security approach in North Sinai in an effort to contain the growing terrorist threat there, where the number of terror attacks had increased from 2.5 attacks per month in 2012 to nearly 12 attacks per month by 2014. But the government was slow to engage the tribes in these efforts, stemming from residual suspicions over tribes’ pre-1979 Israeli links and the fact that many of the new ranks of the terror groups in the province were Bedouin. By 2015, some elements of some tribes began to take a more active role in security issues, seeking to align with the state. On May 10, 2015, the Sinai Tribes Union, an unofficial organization which claims to coordinate activities among Sinai’s 24 tribes, offered 11 recommendations to the Egyptian government related to counter-terrorism, linking increased security cooperation with increased state integration. The group is not known to have participated in any combat operations, though it has published videos purporting to show training operations and recently reported that it had apprehended alleged Wilayat Sinai militants and turned them over to security officials. The union is led by a member of the Tarabin tribe, Ibrahim Ergani. Ergani—who, as chairman of the Misr Sinai Development and Investment Company, has drawn ire for his business dealings with the government and alleged role in financing tribal militias—has had his Cairo home and other property specifically targeted by Wilayat Sinai. Ergani is a member of the Tarabin, Sinai’s largest tribe, and by mid-2016 tensions between the Tarabin and Wilayat Sinai had escalated significantly. Tarabin began targeting Wilayat Sinai members in the wake of a tribesman’s kidnapping and after the tribe clashed several times with the Islamic State affiliate throughout April and May 2017. Throughout 2016 and 2017, other tribal elements began collaborating with the military and participating in a series of special operations: Battalion 103 emerged in Sheikh Zuweid and is reported to have covertly executed special operations while providing security forces with intelligence. More recently, reports emerged in 2018 of the Egyptian government equipping tribespeople in central Sinai with direct counterinsurgency capacities. In addition to providing direct combat support, tribesmen collaborating with the military have provided intelligence and forward scouting. However, the relationship between many of the tribespeople and the government has been strained by continued insecurity in the province and restrictive environment put in place there. In one instance, the Ministry of the Interior claimed to have killed 10 “militants,” but local residents claimed six of the dead were youth who had been in police custody at the time of the attack they were accused of perpetrating. The incident prompted nonviolent reprisal from tribal communities, who carried out civil disobedience to demand a fair investigation into the killings. Shortly thereafter, a number of tribes, including Ramailat, Sawarka, and Tarabin, issued a statement rejecting the calls for a strike and affirming their position standing by the military. The 1979 Egypt-Israel Peace Treaty continues to have a significant impact on the rule of law in Sinai. The treaty mandated that Israel withdraw its armed forces and civilians from the Sinai Peninsula. Egypt then assumed control over the peninsula and its Bedouin population. Ever since, Egypt has struggled to integrate the peninsula’s residents and their local customs into its own legal system. In the relative absence of state legal institutions, Bedouin legal traditions inform how justice is administered in Sinai. In addition, the Egyptian government declared a state of emergency for the Sinai Peninsula. This imposed a curfew and placed restrictions on movement. The local state of emergency was replaced in 2017 by a nationwide variant, which was declared in the wake of the Palm Sunday bombings in Tanta. Further, Egypt has numerous legal provisions which equip it to combat terrorism and which govern counter-terrorism operations, including but not limited to the Counter-terrorism Law, the Terrorist Entities Law, and various penal code provisions. Although a media blackout throughout the North Sinai province makes it difficult to evaluate the Sinai tribes’ participation in counter-terror operations directly, reports on tribes’ collaboration with the military indicate the relationship is expanding in scope and area. While previously limited to the northeast part of the province, reports of a new group, the Abdel Salam group, operating in the center of the peninsula suggest that the military has been more directly arming and outsourcing its operations to the tribes. Wilayat Sinai has also regularly reported having killed or captured Sahwa tribe members. Casualties among those who collaborated with the Egyptian government began in earnest in 2016, following the announcement of Operation Martyr’s Right, as Wilayat Sinai claimed 25 casualties related to tribal informants. The casualty counts fell slightly to 20 in 2017, even as the November 2017 mosque attack in Rawda, North Sinai, prompted the tribes to pledge a more direct role in fighting Wilayat Sinai. Through September of this year, violence against the tribes is down to just six reported instances, in line with fewer reports of Wilayat Sinai activity overall. While arming the Sinai tribes does allow counter-terrorism operations to gain valuable local intelligence and capitalize on local knowledge of terrain and fighters’ movements, the Egyptian government cannot exert command and control over tribal militias as it would with conventional military units. Militias operating in the Sinai have also been linked to extrajudicial killings, with no subsequent efforts to investigate or hold those responsible to account. These dynamics undermine rule of law in the province and underscore the imperative that Cairo’s engagements with tribes include plans to disarm, demobilize, and reintegrate armed tribal elements if and when the conflict subsides. Although some of the increased restrictions put in place in the province earlier in 2018 have eased, the overall approach to countering insurgency in North Sinai remains decidedly focused on kinetic activity, mostly via destructive air and ground campaigns that destroy property and agricultural land. The Egyptian government’s attempts to develop the Sinai, both from internal and external sources, have ultimately fallen short, and often benefits are concentrated only in certain tribes or families. A more robust and holistic counterinsurgency must include more effective and participatory development efforts that provide equitable opportunities for North Sinai citizens and more concerted efforts to address the social and political marginalization of the Bedouin tribes. Sahwa, or “awakening,” is the term Wilayat Sinai uses to refer to tribe members who collaborate with the Egyptian military. The designation is borrowed from the term used for local Iraqi opposition to al-Qaeda in Iraq in 2006–2007.